Did you know that using a mouthguard while playing sport can reduce the risk of injury to your teeth? When it comes to buying a mouthguard, parents who want to reduce their child’s risk of a sports-related dental injury or even a concussion should visit a dentist for a custom-fitted mouthguard. Protecting your teeth from impact is essential. Dentures at Clayfield make custom mouthguards to ensure maximum protection against sport injuries. While many sporting goods stores and chemists sell self-mould mouthguards, only a custom-made mouthguard will guarantee the best results. When compared to over-the-counter versions, a custom-made, properly fitted mouthguard also is essential to player safety. Mouthguard technology has come a long way and custom-made mouth guards fit perfectly over each individual tooth, do not move around in the mouth and they allow you to breathe and speak easily. You can choose from a large range of colours and designs and we can also put your contact details on the inside of the mouthguard in case you leave it behind after the game. We’ll also give you a case to keep your mouthguard safe and clean. We recommend you get your mouthguard checked each year. They generally last between a season and 2-3 years depending on the age of the player. Children up to the age of 15 usually require new mouthguards every year as their teeth grow. Older children and adults still need to check their mouthguard each year as it will wear down over time. To request an appointment for yourself or your child to mould a custom-fitted mouthguard, please contact us. Sustaining an injury during sport can cause damage to your teeth and jawbone. As a result, it can be very costly to replace or repair teeth that have been damaged or knocked out while playing sport, not to mention the inconvenience of missing school or work! For their ability to absorb shock, limit movement caused by a direct knock to the teeth or jaw, as well as stabilise the head and neck, studies have theorised a custom-fitted mouthguard can reduce concussions. Can I wear a mouthguard with braces? It is important for a child and adult to wear a mouthguard during sport, especially if the player is wearing braces. An injury to the mouth may require expensive treatment to repair the braces and any damage caused to the teeth. In the name of safety and protecting your precious smile, we recommend that any patient who participates in contact sports or high-risk activities wear a properly fitting mouthguard. This obviously includes children whose teeth are far more susceptible to damage when their teeth are still in their developmental stage. Custom-made mouthguards from Dentures at Clayfield work to minimise this risk and to cushion any blow that may be felt by your teeth while playing sport. Depending on the severity of the impact, your teeth can be fractured and the soft tissue in your mouth damaged. By covering your teeth individually, we can create a sort of safety vacuum to protect them. Can children with braces have a custom-fitted mouthguard? Of course they can! When we create a custom mouthguard for children with braces we will simply take into consideration the additional space needed and make the necessary alterations. So when we take the impression of their teeth we can block out the braces and fill the spaces in between them and to fit over them as well. 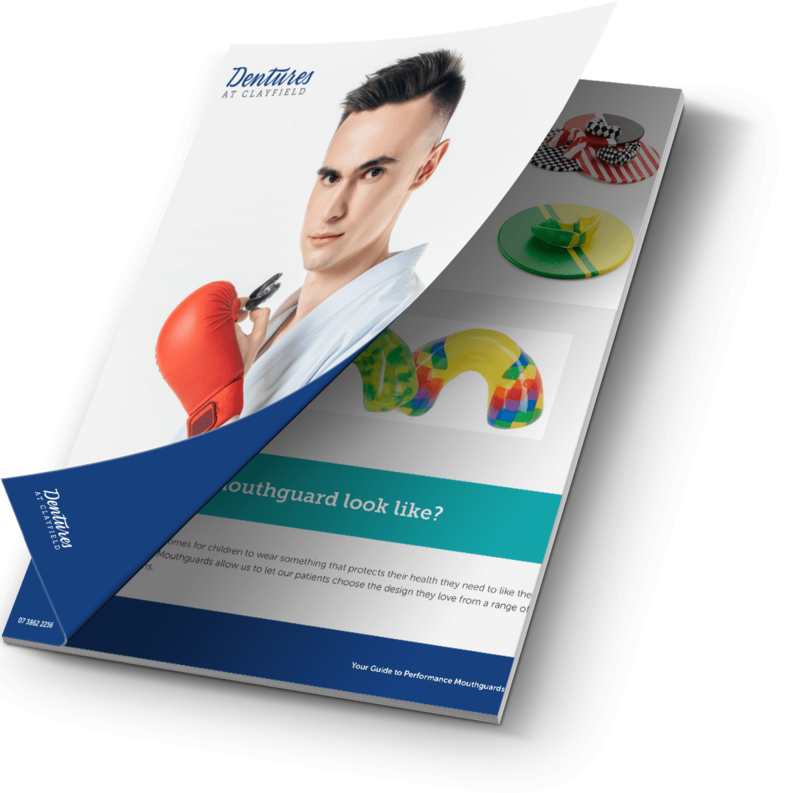 Wearing a custom-made mouthguard also won’t have any detrimental effects on their orthodontic treatment and once their braces have been removed we can take another mould of their teeth to create a brand new one. It is actually quite incredible to what degree a mouthguard can improve your risk of injury simply by covering your teeth sufficiently. Your custom-made mouthguard can prevent a whole host of serious injuries including concussion, incidents of unconsciousness, fractures of the jaws and teeth and even neck injuries by preventing the lower and upper jaws from coming into forceful contact. Your mouthguard will even protect your soft tissues by moving them away from your teeth and prevent cuts and bruising to the lips and cheeks. So if you are playing a sport where contact is expected your custom-made mouthguard can do wonders for the safety of your mouth.